Small Slide Warmer 10" x 7"
Ideal for use in the fields of cytology, histology, pathology, and biology for paraffin tissue section mounting. Thermal heater ensures even heat transfer. Large Slide Warmer 25" x 8"
Ideal for use in the fields of cytology, histology, pathology, and biology for paraffin tissue section mounting. Thermal heater ensures even heat transfer. Anodized black surface provides contrast. LED temperature display. temperature display. Size 25" x 8" warming surface. Includes hinged lid for humidity control. 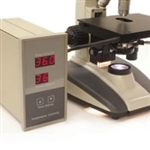 This heating device provides a consistent temperature control of specimens beneath during microscopic observation. Ideal for sperm mobility and velocity analysis and various processes of microscopic examination. The Step Up™ Slide Warmer�s unique parent pending design helps you save space while still meeting a busy lab�s needs. The Step Up™ holds twice as many slides as a flat unit of the same size and also makes retrieving your slides easier since the end of the slide is not on the flat surface.